Landscape of Flavors over at Disney's Art of Animation Resort offers a variety of quick service items. 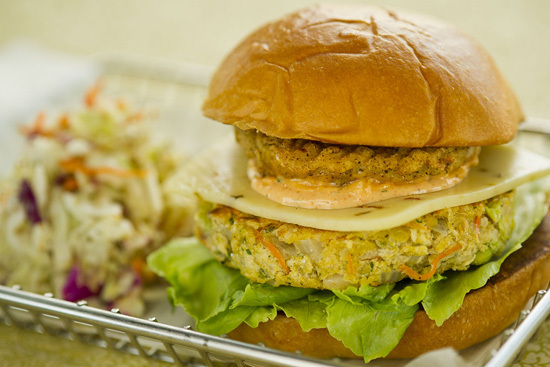 One of the newest items to arrive at Disney World is this vegetable burger made with white beans and topped fried green tomatoes, pepper jack cheese and remoulade sauce. Cover navy beans with water in a pot and soak overnight. Drain and wash beans; cover with water and cook until tender. Place soybeans and carrots in a heat-proof container; pour boiling water over vegetables and steep for 2 minutes. Drain, cool, and set aside. Place cooked navy beans in food processor, reserving 1 1/4 cup. Puree until smooth. Add cornmeal and pulse until well mixed. Remove from food processor and place in a large bowl. Add onion, corn, potatoes, parsley, soybeans, carrots, salt, pepper, and Sriracha, mixing well. Fold in reserved navy beans and egg whites. Divide evenly into 8 patties. Heat 1/2 cup oil in a large skillet over medium-high heat until shimmering. Lightly dust patties with cornstarch and fry in batches until golden, about 5 minutes per side, adding more oil as needed. Lightly flatten patties with spatula when turning. Drain on paper towels and serve hot. Slice tomato into 8 slices, about 1/4-inch thick. Place in a glass baking dish and cover with yogurt. Refrigerate for 45 minutes. Combine pepper, garlic, cumin, chili powder, and cornmeal in a small bowl, mixing well. Heat 1/4 cup oil in a large skillet over high heat. Remove tomatoes from yogurt and dredge in cornmeal. Fry in batches in hot oil until golden brown, adding oil as needed. Drain on paper towels, season with salt, and keep warm. Combine all ingredients in food processor or blender. Refrigerate in airtight container. Stack burger, slice of pepper jack cheese, slice of fried green tomato, and 2 tablespoons remoulade on a toasted brioche roll. Serve hot. Thanks to the Disney Parks Blog for this delicious recipe from Disney World's newest resort!